Today, the fifth annual PARK(ing) Day, is the day purportedly anti-parking terrorists activists turn metered parking spaces into art shows, community spaces and mini shops. Submit your photos and check out the gallery of past reclaimed spots below. We're told this event is a pyschogeographic stance against the curbside parking infrastructure, which activists say "results in increased traffic, wasted fuel and more pollution. The strategies that generated these conditions are not sustainable, nor do they promote a healthy, vibrant urban human habitat. PARK(ing) Day is about re-imagining the possibilities of the metropolitan landscape." We are, first and foremost, a lover of all things cars, but curbside parking in the middle of downtown areas isn't really about cars. It's more about inefficiencies and creation of more traffic. Heck, unless you live on Alameda, it's not even good for car-watching because it's mostly Honda Accords and beat up Neons. The problem is many of these anti-parking activists are nothing more than anti-car activists in disguise. They sneakily use terms like "parking" as a way of saying "cars." For these people we say — go to hell. But to those real infrastructure-obsessed members of this community — we tip our hats to them and wholeheartedly support their cause. 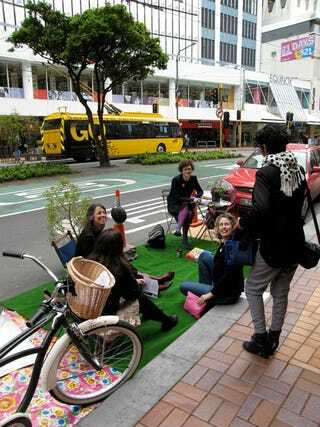 There are PARK(ing) Day sites around the world, as you can see from the pics, which you can check out here. HINT: there are a lot of them in San Francisco and Austin and other places like that, though we're also told they're in Salt Lake City and Tulsa. If you plan on participating in one of these — or if you plan on breaking one of them up — drop a photo in the comments below and we'll throw it on the site. need for new approaches to making the urban landscape," says Rebar's John Bela. can improve the character of the city." experimentation, activism, socializing and play," says Blaine Merker of Rebar. offers has lasting effects and is shifting the way streets are perceived and utilized." will be hard to miss," she adds. the Van Alen Institute in New York.